Welcome to the Stalltastic FAQ Help area. We love the independence, variety and picturesque locations that local Events, Markets, Farm Gates and Cellar Doors give to us all. So we created Stalltastic as a place where Markets, Events, Farm Gates and Cellar Doors can have a home and be promoted and found. Stallholders can connect to these events and so be featured to the public. Stalltastic is also a community, a place for information on running events or stalls to be shared. What is a Cellar Door? Vineyards and Boutique Breweries/Distilleries open to the Public, showcasing their products directly to the public. What is a Farm Gate? Farm based businesses that are open to the public. Typically showcasing their produce and often with a eatery. As part of the registration process an activation email will be sent to the email account you provided. Until this link is clicked, your account will remain in-active. This automatic email we send is normally delivered within a few minutes. So please check your spam folder if you cant find it. If you still have an issue please Contact Us and we will help. To join Stalltastic is easy and its also free. Your name, email address and a password of your choosing is all that's required. Simply sign-up by completing the registration process. Jump to Registration. We will send an email with an activation link to complete the registration process. Your privacy is important so we will never give your details to third party companies. Once you have registered you can then list events, stallholders or just stay part of the community to receive newsletters. A picture says a thousand words - so any listing on Stalltastic should ideally have an image. This is easy to do, simply login to Stalltastic and edit your listing. On the first page will the "Main Image" field be found. Click the "Browse" button to locate your image file. Note that the Image File will not actually be uploaded until you update or save your listing. Where you already have an image loaded and saved - it can be displayed by clicking the "View Current Image" link. Images on Stalltastic are displayed in a 8:5 ratio which is landscape format. We will work some magic to adjust your image to display in the best possible way, but a landscape image will generally shown as you intend it to be. We recommend that Images should be at least 400 pixels wide to preserve quality. This is not normally an issue as most camera pictures are 2 or 3 thousand pixels wide. Image file types supported include JPG and PNG. Where a specific image is not loaded Stalltastic will display a default image. As always Contact Us if you need additional help with your listing. How do I claim an existing Event Listing? 3) click the "Own this" link. How do I create a new Event Listing? Step 1: Login to your account, or register to create an account if you don't have one. Step 2: Once logged-in, add your event from the My Account menu to create your unique free event page. Or Click here to add event. Step 3: Tell your Stallholders so they can create their own unique free stallholder page and link it to your event page. Having Stallholders linked to your Event enhances your listings value to the public. OK, firstly remember that you can always change or edit your listing. The quickest way to find your listing is under the My Account - My Events menu. It is also available from the dashboard. Of course you must be logged in to see these options. Your Events name, ie "Somewhereville Donuts Festival"
Its a good idea to put your town or suburb name into the event name. It is not recommended to put a year (ie 2017) or words like "Inaugural" in the name. Those are details that can be put into the description. Some categories to help define your Event. This aids the general publci finding you through searches. If you have a suggestion for another "type" please let us know! Your listing will have more impact with an image. Landscape style - specifically 8x5 ratio is best. Please remember that must have the rights to use the image uploaded. This is the cost (if any) for public entry. This is not site costs for stallholders/vendors. This is the blurb to highlight your event. This will be publicly displayed contact information for your Event. Note that your account details (name, email) will not be listed on the website (unless you enter them here as the listing contact details). This is a link to an external website or Facebook page for your event. Type in your Events location into the provided google maps section. You can fine tune the location by dragging the location marker. You may wish to provide additional location or parking/public transport details here. A description on event frequency that will be displayed as summary information. Examples are "First Saturday of the Month", "Every Friday Night"
Note that this is not used to generate "event dates" for the calendar. State the opening hours for the event here. ie "8am-1pm" or "4pm till late"
Tick this box if you would like us to advise our existing Stallholders about your event. This is information is not displayed on the Stalltastic website. Select days that event is open. This allows you to take into account public holidays (esp Christmas and Easter) easily. Note that periodically you should update the dates as time passes by. You can also deselect days if there is a change to schedule. It is important to ensure that your event dates are complete and correct so to maximise your engagement with the public and stallholders. Remember that the frequency field is displayed as text information only, and does not generate dates for your event. You must enter the dates into the calendar separately. If your events dates "roll off" don't worry your event will still be found. Events without any valid future dates will be listed as "expired". It is best to ensure that a future date is associated to your event. We recommend, as a minimum, that every 3 months your review your event dates to make sure they are current. This is a good time to check other details as well. New events that have not finalised their dates, should choose a date or dates that are most likely. Until your dates are final, please add to your event description and/or frequency the status TBC - to show event dates are yet to be confirmed. Once your dates have been finalised other dates should be deselected and the TBC notes removed. Typically around Christmas, New Year and Easter regular event dates are changed or extra dates added. Remember to update your event listing to reflect these changes. An additional day you are open can just be added to your normal event listing. Sometimes though you might want to make a new event entry if you are having an event that is different enough to warrant its own page. Your ad-hoc event may have a special theme or different times to usual. For example if your usual event is daytime and you are having special twilight market for Christmas you might like to list this as a new event. On Stalltastic all standard event listings are free and you are not limited to one listing, however multiple listings will require multiple management, so choose what is best for you. This is easy to do, simply login to Stalltastic and edit your event. Navigate using the Next buttons to move to the last section (page 3 of 3) which has the calendar. Selected dates (purple) will be marked as valid for your event. 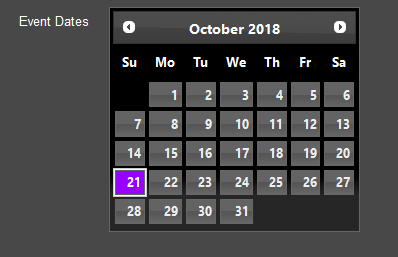 Click on a selected date to deselect it. You can change the month by using the small arrow buttons next to the month name. This example has 21 Oct 2018 marked as one of the event dates. How much does an event listing cost? Standard listings are Free, and always will be. If you would like a premium listing for more prominence, then please Contact-Us for full options and pricing. How do I create a new Stallholder Listing? Step 1: Login to your account, or create one if you don't have an account. Step 2: Once logged-in, add your stall from the My Account menu to create your Stallholder page. Or Click here to create. Step 3: Search Stalltastic to find the events you attend. Step 4: From the event page click the "Link your Stall" button to connect your Stalltastic page. Alternatively you can supply some basic event details to Stalltastic (including event organiser email) and we will create a default listings for them, and allow you to link quickly. OK, firstly remember that you can always change or edit your listing. The quickest way to find your listing is under the My Account - My Stalls menu. Your Stalls business name, ie "Bobs Bangles and Bling"
Some categories to help define your Stall business. If you have a suggestion for another "type" please let us know! This is the blurb to highlight your business. This will be publicly displayed contact information in your listing - Name, Email, Phone Number. This is a link to an external website or Facebook page for your business. How much does a Stallholder listing on Stalltastic cost? Standard listings for Stallholders on Stalltastic are free, and always will be. How can I attend an event and how much does it cost? Prospective stallholders should contact the event organisers directly. All event listings have contact details in the Fact File information.